The skills of softball — running, swinging, fielding and throwing — require a coordinated effort from numerous muscles throughout your body. Learning these contributing muscles and understanding how they function when you play the game can help you design and implement an appropriate, softball-specific training program. Following such a program can maximize your performance level and minimize your risk for sustaining injuries. Although the main abdominal muscles — the rectus abdominis and transversus abdominis — don't play a major role in any softball skill other than to provide support for the spine, the oblique muscles on the sides of the abdomen are major contributors to the rotational elements of the swinging and throwing motions. These include the external oblique, which attaches to the lower eight ribs on top and to the iliac crest of the pelvis on the bottom, and the internal oblique, which attaches to the lower four ribs on top and to several structures on or near the pelvis on the bottom. The arm and shoulder muscles play a significant role in the softball swinging and throwing motions. The swinging motion involves sequential contractions from the triceps brachii and anconeus muscles of the rear arm, the pronator quadratus and pronator teres muscles of the rear forearm, the supinator muscle of the front forearm and the wrist extensors and flexors of both forearms to accelerate the bat barrel to and through a pitched ball. The throwing motion for position players requires contributions from the deltoid and rotator cuff muscles of the throwing shoulder, the triceps brachii and anconeus muscles of the throwing upper arm and numerous muscles within the throwing forearm. Many of the same muscles also contribute to the windmill pitching motion, but in an entirely different manner because the release is underhanded instead of overhanded. The deep spinal muscles and the erector spinae muscle group within the lower back assist the obliques with the rotational elements of the softball swinging and throwing motions. A variety of muscles within the upper back, including the rhomboids and trapezius muscles, also help move the scapula bones, allowing for a full range of motion when swinging and throwing. The latissimus dorsi muscle, which spans the sides of the back, also contributes to the overhand throwing motion by extending and inwardly rotating the throwing upper arm just prior to release. 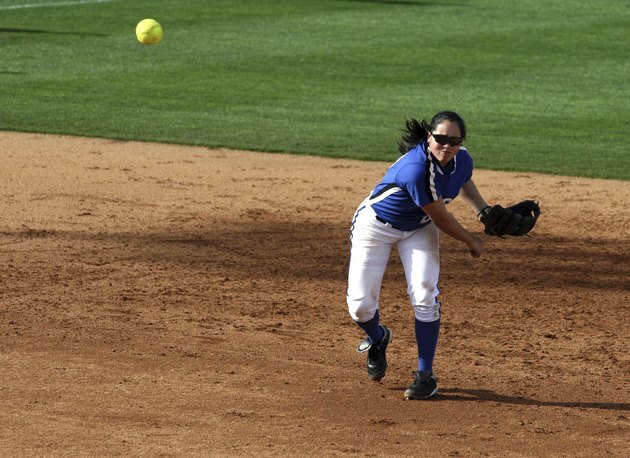 The leg muscles play a significant role in all aspects of softball. Baserunners, infielders and outfielders have to sprint frequently, which requires intense contractions from the muscles that extend your hips, knees and ankles — the gluteus maximus and hamstrings, the quadriceps and the calves, respectively. The hip and knee extensors also allow catchers to squat and stand up repeatedly. Softball pitchers and throwers use their leg muscles to generate momentum, allowing them to project the ball with more velocity; batters use their leg muscles to help accelerate the bat barrel to and through contact.